What I like Wednesday: My day today! November 21, 2012 November 21, 2012 Categories What I like Wednesdayanniversary, birthday, cake, Goodwill Outlet, What I like Wednesday2 Comments on What I like Wednesday: My day today! Today I went to the Goodwill Outlet and bought some Christmas lights and some Christmas cards. The whole experience was intriguing because I had never been to a Goodwill Outlet before. It’s one big open room with loads and loads of big blue bins filled with stuff. There’s really no rhyme or reason to it. Well, I take that back, there are clothes bins and then there are “everything else” bins, so there is some kind of organization. What really surprised me was how crazy people got when new bins came out (they exchange them every 30 minutes). People lined up, waiting for the bins to come out. And once they were all out, the employees would say “okay, shop” and the people would flip out. I saw one woman just tossing stuff into a cart. I mean, I don’t think she even knew what she was taking. I’m not really sure what these people were planning to do with all this stuff, maybe sell it? Either way I’m just thrilled that I got all my stuff for $.98. That’s right! That’s all I spent. You pay by the pound, which is a pretty cool thing I think. Then, I went to work, and my desk area was decorated for my birthday! 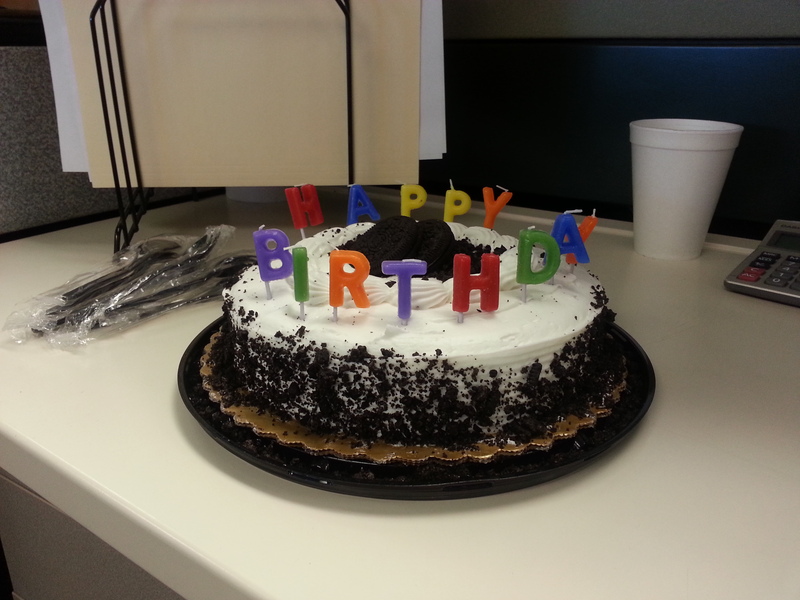 And what’s more, my boss got me cake and my coworker got me ice cream! It was so sweet and delicious, I absolutely love it. I feel so loved and welcomed at my job, it’s just so awesome. And, finally, WordPress just told me that today is my four year anniversary with them! I think that is so lovely and such a happy thing that I wanted to share! I hope I have four more years with WordPress, maybe one of these times I’ll actually fork over some money and have my very own website! Hope everyone has a fantastic day tomorrow wherever you are and whatever you’re doing! Happy day for you!! I love you dear friend!